To add Jive Business Continuity to your services, please contact your sales representative at 844-731-9949. Jive Business Continuity (JBC) is a server-based application that preserves your most essential on premise phone functions during an Internet disruption or a complete outage. Even with no Internet, you can still call staff and emergency services (requires Analog Failover) with local survivability. JBC also offers system monitoring, email alerts on call quality with Jive Alert Center, and dedicated project management. A JBC device needs to be up 24/7. During installation, ensure the device is properly secured and cables cannot be accidentally unplugged. 1. Plug in the JBC power adapter. 2. Plug in the network cable from your switch into the JBC network port. 4. Click System Settings in the left sidebar. 5. From the Business Continuity tab > JBC section, click the JBC that matches the MAC Address (12 digit string that is unique to each device) found on the bottom of your JBC. The internal IP address of the JBC device. This field does not change the network IP address on the JBC device. It is used by phones that are configured to connect through the JBC, and it lets them know where to send SIP (or phone) traffic. Since this setting references the JBC device’s IP address, we highly recommend configuring the JBC with a fixed IP address through a DHCP reservation. This will help to avoid the possibility of a mismatch between this setting and the JBC device’s true IP address. If you are using a managed switch with multiple VLANs, the port you connect the JBC to needs to be set to access the same VLAN as the phones. Complete the settings below only if you have purchased Analog Failover (provides limited calling with external numbers, like 911, during an internet outage) and an ATA is connected to the JBC device. 1. From Jive Administration, click System Settings in the left sidebar. 2. From the General tab > Defaults section, select Use and then choose the desired JBC. 2. Click the device that requires a different JBC than the PBX default. 3. From the Device Settings tab > General Settings section, select Use and then choose the desired JBC. In order to access Jive Alert Center, you must have configure PBX or super admin permissions given to you by a system admin. 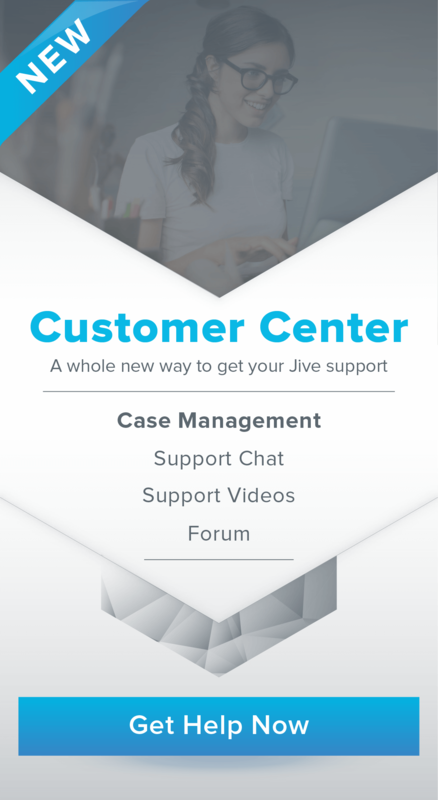 Note: Alternatively, you can access Jive Alert Center from the Jive Administration menu options. A JBC device is considered offline when it is unable to communicate with Jive. For example, a JBC device has no power or cannot reach the Internet. A JBC device enters failover mode when it is unable to communicate with Jive while still providing limited services between local devices. For example, the Internet is down but extension-to-extension dialing is still possible. Note: If analog phone lines are connected to a JBC device, outbound, limited inbound, and emergency calls are also available from these lines during failover mode. 3. Enter the email address for each alert recipient. All alerts are sent from noreply@jive.com (make sure this address is not marked as SPAM or junk mail). 4. From the Network Quality Alerts tab, enable Send Network Quality Alerts. 5. Enter the email address for each alert recipient. All alerts are sent from noreply@jive.com (make sure this address is not marked as SPAM or junk mail). The average time it takes call audio packets to travel from a phone to Jive Cloud and back. If latency measures above 100ms, call quality could be affected. The change in the amount of time it takes for call audio packets to move from a phone to Jive Cloud (i.e. call audio is arriving out of order). If jitter measures above 10ms, call quality could be affected. The percentage of call audio packets lost while traveling from a phone to Jive Cloud. If packet loss measures above 0.5%, call quality could be affected. 1. Press the power button (do not press and hold) on the front of the JBC device. 2. Confirm the JBC device is powered off (light will turn amber). 4. Press the power button again to turn the JBC device back on. If this does not resolve the issue, please contact Customer Support at 800-614-7904.